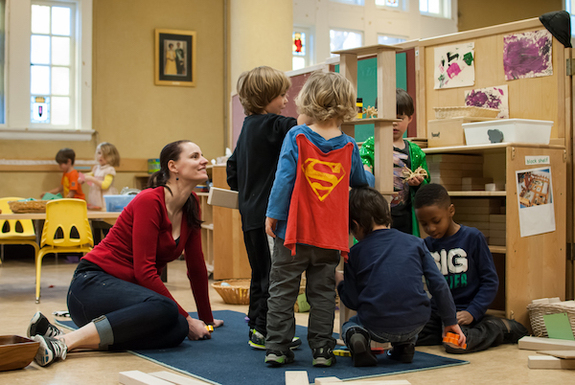 As the director of a play-based preschool, I often meet prospective parents who support the idea of letting children play in preschool, but are worried that their child won’t be ready to succeed in Kindergarten. I tell them what my experience has taught me and what research shows: that play is actually the best way to build a strong foundation for all of the skills that kids need in elementary school. Still, they are not always entirely convinced and sometimes enter our school still worried that maybe they’ve made the wrong choice for their three- or four-year-old. Once our preschoolers move on to elementary school, the conversation changes. Parents tell me how well their child has transitioned, that they were more than prepared for selective-enrollment tests and private-school evaluations, and that they stand out among elementary-school peers as particularly curious, self-reliant, empathetic and hard-working. Whether the preschoolers have moved on to a public neighborhood, magnet or selective enrollment school, a parochial school or private school, it becomes clear that play in the preschool years translates to success in elementary school. Imagine a snapshot of a morning in a high-quality child-centered, play-based preschool classroom. A group of children are mixing paint colors in the art area, trying to design a palette of new colors with creative names. Some colors are turning out how the young artists envisioned them, but others are a murky mess. Two children with a grand plan to open a restaurant in the play kitchen are full of joy, but working through conflicting visions of what the restaurant will serve, what it will be named, how many customers it will seat, and who gets to be the first cook and first server. In the block area, kids are building Chicago, with roads, buildings, bridges and cars. But one building falls over and the children have to figure out why it fell. Did someone bump into it? Was it not structurally sound? Teachers are carefully observing, asking questions and entering play to extend and deepen children’s learning, and helping children talk and listen to each other to resolve their disagreements. Children are becoming adept at conflict resolution as they work through buildings falling and restaurant naming. They are developing grit and resilience as they recover from a conflict or disappointment, accept that they will have to wait for a turn and ultimately stay in a play area to try again. They are becoming independent as they mix and build and share ideas, often without direct adult involvement. They are coming to a genuine understanding that being one of many in a diverse group of personalities is not easy and yet it has such wonderful rewards. They are learning that their ideas and questions and those of other children are important and can take them to exciting new places. They are finding themselves motivated to read, write, think scientifically and calculate as they count out the right number of blocks for a building base, measure the exact amount of yellow to add to the red, or try to write down or read “Sunset Orange,” “Happy Unicorn Cafe,” “Superman Street,” and the list of that day’s cooks and servers. While thinkers like John Dewey and Lev Vygotsky identified the connection between play experiences and children’s development as early as the 1930s, there has been an explosion of research on the power of play in the last decade. These studies are backing up what we see over and over again: Whether our preschoolers’ next school experience will include Waldorf or worksheets, Montessori or the MAP test, their time engaging in child-centered play sets them up to enthusiastically embrace new skills and knowledge and thrive in a classroom setting. If you find yourself drawn to a play-based preschool but are worried about what’s next, explore the research and know that choosing a play-based education for your young child is the best choice to promote their later success in school and life. Laura Pinsof is the director of Families Together Cooperative Nursery School, a preschool offering exceptional play-based programs for 2.5- to 5-years-olds in Chicago's Edgewater neighborhood. Laura holds masters degrees in Teaching and Educational Leadership and is passionate about putting creative play, problem solving and socio-emotional development at the center of early childhood education.